What in the world is a cloffice? 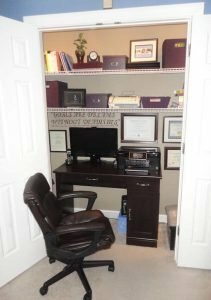 Basically, it’s a closet that has been turned into an office. The combination of the two words makes this fun new term that everyone has been requesting from My Custom Closet. Do you have a spare closet in your house that does nothing but collect junk? Is the closet in your guest room left bare when friends and family aren’t visiting? Enter the cloffice! A need for a cloffice isn’t limited to those who work from home. 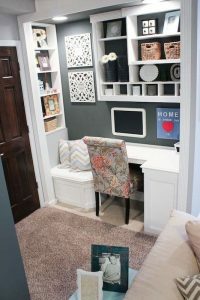 It can be used as a homework station, a place to access important documents, a station where the family computer is kept, or the perfect nook to keep bills sorted and budget books organized. What Are The Benefits Of A Cloffice? Multi-sized shelves, drawers, and open cabinets create efficient storage space with plenty of room to add personalized decorations. For starters, a cloffice can help utilize otherwise wasted space in your home. It will help cut back on the clutter that collects in closets you have no other use for, and adds shelves and cabinets to help get you organized. Think of this newfound space as a brand new area in your home that you can decorate however you choose. Use vibrant colors, wallpaper, or decals to make a statement and create a focal point in a room, or keep thinks simple and sleek by hiding your new workspace behind a sliding barn door or beautiful new French doors. 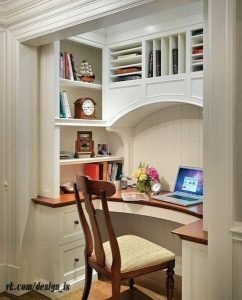 Or, turn it into a secret space otherwise hidden from view, and keep the existing closet door closed around your personal workspace. The possibilities are endless. Always dreamed of a workspace at home but couldn’t come up with the free space to set one up? With this creative solution, your workspace doesn’t take up any extra room in your home. It is tucked away in an area that was always there to begin with! Your new nook can literally disappear with the closing of the door, while an official office requires an entire room in your house, and even a desk eats up valuable real estate in a room’s square footage. Plus, it’s generally much cheaper to design and install a cloffice than it is to buy a large, separate work station with all of the organizational and storage capacity that these innovative designs can give you. A good cloffice is usually a DIY installation. 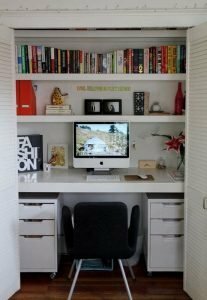 While it contains some of the basic elements needed to create a compact workspace, the design tends to fall short in several areas. Take a look at this photo of a “good” cloffice. The vertical space is not fully utilized; the homeowner is wasting precious real estate on the walls that could be used for more efficient storage space. The shelves that do exist are made of flimsy wires, which can only hold so much before they topple and fall. 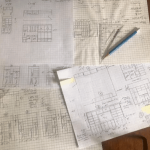 The last think you want is to put all of that work into designing and installing a DIY cloffice, only to have everything come crashing down on you! In general, this space lacks the depth that a professional designer would put into place. It serves its purpose and is a functional workspace, but really that’s about it. I would imagine the homeowner typically leaves the closet door closed on their cloffice, hiding it from view. In this photo, it is clear that the workspace was designed and installed by a professional. The cloffice looks like an actual upgrade, with durable shelving and a floating desk to match the shelves. However, the professional who worked on this cloffice neglected one thing: originality! The all-white space is dull and lackluster. Plus, the storage space is far from efficient. Two floating shelves stretched across the entire space limit the homeowner’s ability to organize and store documents and other items. 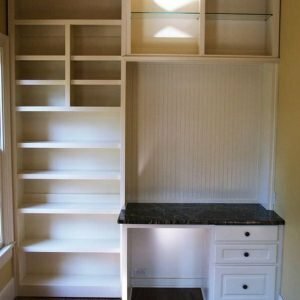 Shelves and cabinets of varying sizes would have allowed for a more efficient storage space, and would have transformed an otherwise boring installation into a more visually appealing space. Now this is a cloffice! By painting the wall in a dark slate gray color, the cloffice becomes the exact opposite of a boring workspace to be kept hidden away behind closed doors. It becomes the focal point of this room, and a beautiful one at that. This is the kind of eye for detail you can only get by working with a reputable professional like My Custom Closet. Our wide range of storage solutions gives you endless possibilities, and our experts know just what it takes to transform even the smallest of spaces into functional, attractive areas you’ll look forward to showing off. Take a look at some of our favorite examples of cloffices. Some of these workspaces were DIY projects, while others had the help of a professional. Of course, it’ll be easy to spot the difference! Ready to start designing the perfect work station for your home? Contact My Custom Closet today to get started on your design. I LOVE our new cabinets!! Bryan from My Custom Closet designed a wall of cabinets for our laundry room. He was very professional and nice to work with. He listened to our ideas and the results were better than I imagined. Will definitely use again and highly recommend!! ©2019 My Custom Closet. All Rights Reserved.